Very antibacterial while also conditioning soap. Great lather! Anti-Bacterial And Conditioning In One! Ingredients: Saponified: Extra Virgin Olive Oil, Palm Oil, Coconut Oil, Organic Beer, Avocado Oil, Fir Needle Oil, Camphor Oil, Lemon Oil, Cedarwood Oil, Patchouli Oil, Turmeric Oil. May have come into contact with wheat or tree nuts. The top note is pine I believe, a bit strong when you first smell the bar, but the drydown is wonderfully woodsy, like cedar and manly stuff ;) He says that his beard feels softer, and I love the smell. For that price, I feel it's even better than beard oils. Bought this as a Christmas stocking stuffer a while back for my brother. He not only likes the scent, but says it works great for his beard! I bought this for my husband and we noticed a difference right after the first use. His beard is much softer and smoother to the touch (that dry, coarse hair feeling is gone). The smell is great and "manly" too! It also worked well on his moustache. I highly recommend this soap. I can't rate this on anything but smell. It smells like eucalyptus. Like Vicks Vapo Rub. I never even gifted it to my husband because it smells way too strong of essential oil. I was planning on using it as a stocking stuffer but even wrapped up it smells way too strong. I gave it to him early and he agrees. He's not a fan. Bought this soap for my husband. Although advertised as beard soap, he uses it for his entire face. The soap smells great and my husband really likes it. Bought this to add to a gift basket for my brother in law. He is proud of his beard and loves being able to take a few minutes to himself, men love being pampered too! Bought this for my boyfriends as a joke - totally fell for the packaging. Anyways, discovered that I am absolutely in love with it myself. The smell is slightly rustic and woodsy - but not overly 'manly' or strong. It lathers beautifully. Usually I hate using bar soaps because it leaves that weird filmy/streaky texture on your skin. This does not. It leaves my skin feeling so soft and smooth and moisturized. I absolutely LOVE this product and will be buying more for myself! Calling it "beard soap" is a clever gimmick I guess, but they really should also sell it as regular soap. 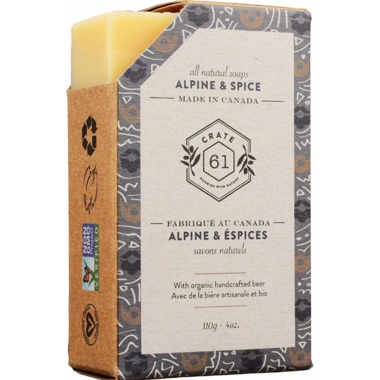 It's real soap made from saponified olive oil to make it real Castille soap, saponified palm and coconut oils to make it cheaper, beer as a marketing gimmick, and essential oils to make it smell great. And it does. It's a pure, natural soap, made pretty much the way real soap's been made for centruies. It's much better for your skin than modern so-called "soap" which is actually detergent, it lathers well, and it works great. I used it for shower soap and shampoo, and will do so again. Highly recommended. Bought this for my boyfriend, he loves it and not only is his beard softer but there are less ingrown hairs and breakouts. Will purchase again! Bought it for my boyfriend and he loves it. Very strong fragrance does the job.